UPDATED: Mon., Oct. 15, 2018, 7:07 p.m. The band was ready and waiting. Coeur d’Alene High School’s marching band, 54 members strong, lined the walkway at the Hagadone Event Center on Monday morning, flanking the stairs that lead down to the dock. As “American Idol” judges Katy Perry, Luke Bryan and Lionel Richie walked up the stairs for a filmed segment of the long-running singing competition, the Viking marching band launched into a beloved 1977 funk hit, “Brick House” by the Commodores. Needless to say, Richie, who co-wrote the song with his former Commodores bandmates, smiled widely, and once he reached the top, got into the groove, showcasing a few dance moves. “American Idol,” which started on Fox in 2002 and moved to ABC last season, helped launch the careers of Carrie Underwood, Kelly Clarkson, Adam Lambert and the rock band Daughtry, among many others. Coeur d’Alene is one of five cities across the country hosting judge cuts, where contestants get their first chance to audition in front of judges. How the 70 hopefuls auditioning in Coeur d’Alene on Sunday and Monday fared won’t be revealed until the new season starts in the spring. 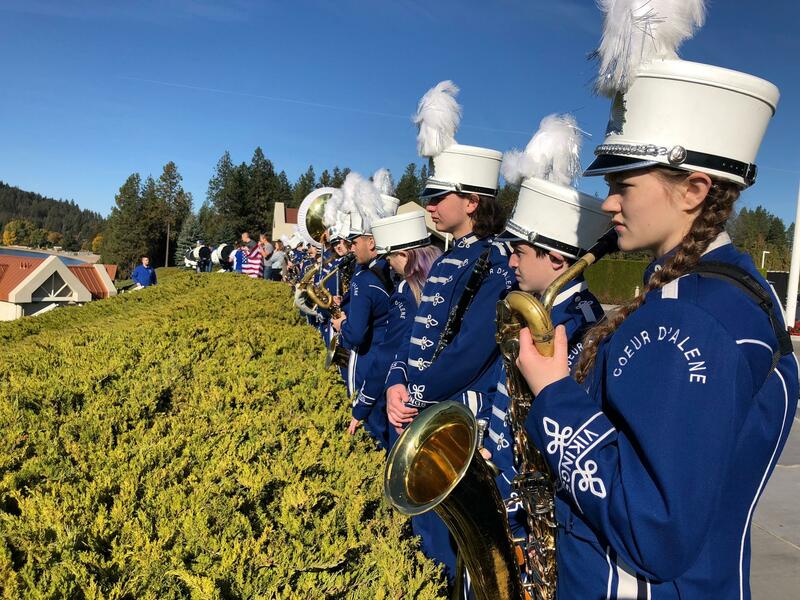 When “Idol” producers reached out to Coeur d’Alene High School to enlist the help of the school’s marching band, band director Jim Phillips jumped at the chance. Prior to playing for the three judges, the band had an opportunity to perform a concert for one: Perry. Well, Perry and her dog, Nugget, who made the trip to North Idaho with her. The Viking band played the school’s fight song as Perry danced in the plaza adjacent to the event center. Afterward she also spoke with the students for a minute or two. “It was really cool,” Reilly Burton, one of the band’s drum majors, said of the opportunity. At least one huge Katy Perry fan in the band was thrilled to be this close to the music icon. “I was thinking my head was going to explode,” said freshman Samantha Cordova. Phillips said the band had been practicing hard for their TV appearance. He also used it as an opportunity to remind the band about flexibility. How flexible? Well, they had to perform again as producers brought Bryan back up the stairs for additional shots. It’s probably worth it for an experience they’ll never forget. Published: Oct. 15, 2018, 4:01 p.m. Updated: Oct. 15, 2018, 7:07 p.m.